During the past six months, there has been contention from the FDA about using wooden boards to age specialty cheeses, mostly because wood is porous and has a tendency to propagate bacteria on its surface. As natural cheese lovers know, most bacterial cultivation is a positive thing, and lends to the development flavor profile of the cheese at hand. The cheese cultivates its own ambiance due to this good bacteria, protecting it from other harmful pathogens. The main concern is proper care and maintenance of these wooden boards, including consistent methods of disinfecting and finishing the wood in order to prevent excessive bacterial growth that can cause off flavors. As usual, I take the natural approach with wood and food. I first wash my wood with lightly soapy water, rinse, and then dry with a cloth. 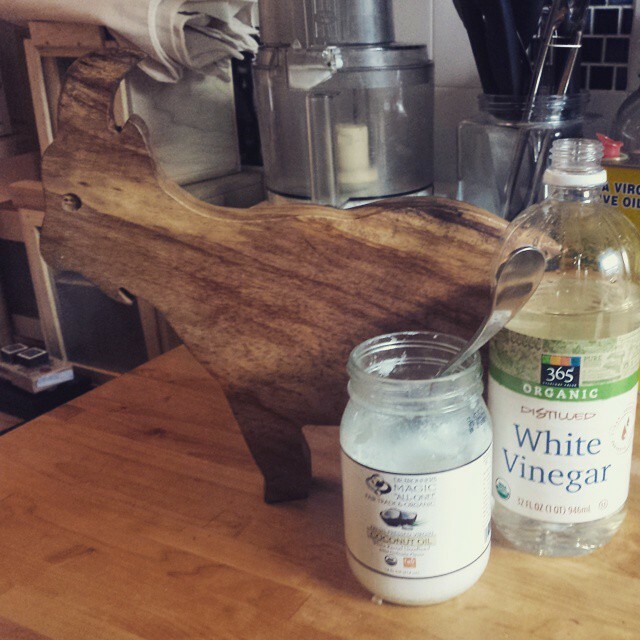 White vinegar is an excellent disinfectant that can be applied with two parts water, one part vinegar. Another recommendation from Culture magazine is to cover your wooden board with sea salt and and scrub it with half of a lemon. After disinfecting, dry your board, and coat it with a luscious layer of coconut oil. This will seal and smooth the crevices. Check out this article to see a wide variety of methods! Tags: affinage, microbiology. Bookmark the permalink. Previous post ← Cheese Making Gift Certificates!